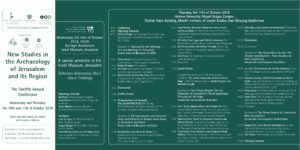 The 2018 edition of the conference, "New Studies in the Archaeology of Jerusalem and Its Region," includes lectures on recent work in the Jewish Catacombs of Villa Torlonia in Rome and a tour of a photography exhibit of the site after excavation and conservation work beginning in 2016. 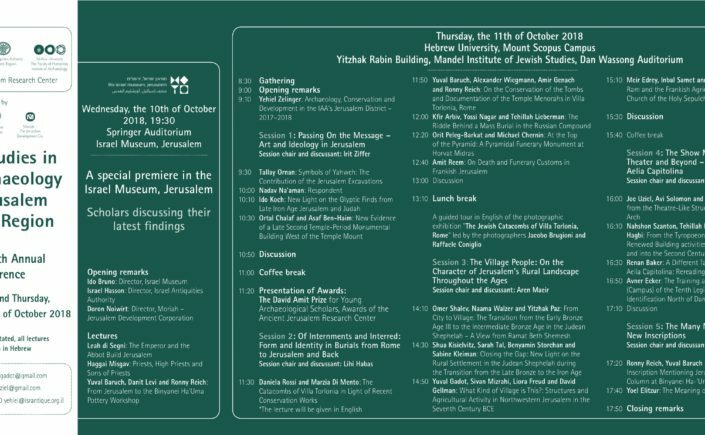 Both talks are given during the second session on "Internments and Interred: Form and Identity in Burials from Rome to Jerusalem and Back", chaired by Prof. Lilhi Habax, starting Thursday, 11 October at 11:30 a.m. in the Dan Wassong Auditorium in the Mount Scopus Campus of Hebrew University of Jerusalem. Italian archaeologists Drs. Daniela Rossi and Marzia Di Mento, representing Rome's Archaeological Superintendency, will speak first on "The Catacombs of Villa Torlonia in Light of Recent Conservation Works". 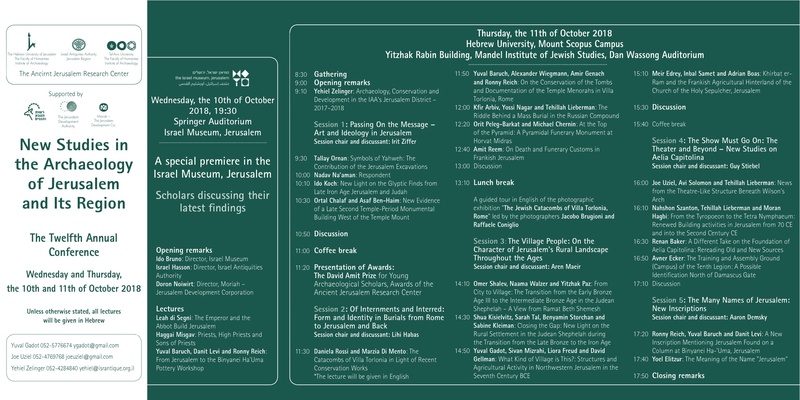 The second lecture, "On the Conservation of the Tombs and Documentation of the Temple Menorahs in Villa Torlonia, Rome," is presented by Israeli Antiquities Authority officials and collaborators, Drs. Yuval Baruch, Alexander Wiegmann, Amir Genach, and Ronny Reich. Following a lunch break, photographers Jacopo Brugioni and Raffaele Coniglio will lead a tour in English of their photographic exhibition "The Jewish Catacombs of Villa Torlonia, Rome" on display at the conference site. The ancient cemetery used by Jews, below the grounds of a public park, has long been closed to the public and off-limits even to many scholars. It is anticipated that small group access might be possible starting in 2019, also the centenary of the catacomb's discovery, following efforts to stabilize the underground site's microclimate and physical plant and to ensure Jewish burial of any human remains according to modern Orthodox practice and in concordance with Italian law n. 101 of March 8, 1989, guaranteeing the civil rights of Jews in the Republic of Italy and the freedom of worship according to conscience. The task of reburying the ancient bones or moving them, when necessary, to new locations has been carried out by volunteers with the Israel-based rescue and recovery organization Zaka at the behest of the Italian rabbinate, which considers halakhic treatment of the bones a priority in any study the site. In the course of the burial and rebuilding operations, new artifacts and structural details have emerged, including clearer views of the scratched and painted inscriptions and other markings on tombs, all in course of study and publication. These no doubt will be the main focus of the lectures and photo exhibit in Jerusalem next week. Conference organizers: Yuval Gadot 052-5776674 ygadot@gmail.com Joe Uziel 052-4769768 joeuziel@gmail.com Yehiel Zelinger 052-4284840 yehiel@israntique.org.il.